This past month, Rachael Bryant of the blog “Meatified,” came out with her very own book, of which she was so kind to send me. So far, my family and I have made quite a few dishes from Nourish, and truly don’t plan on stop anytime soon. 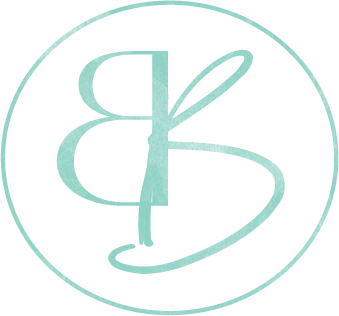 After quickly flipping through the pages of Rachael Bryant’s cookbook, I then went through and slowly read through each and every recipe, deciding with my mother which ones we could add to the weekly menu. Overall, there were so many recipes that we already had the ingredients for, that it was not hard to get started right away trying the recipes. Though all cookbooks that we have are amazing, and certainly useful when trying to come up with meals during the weeks, my mother typically already has the meals already planned out. Therefore, if I come to her saying I would like to change things up, it can be a bit stressful. However, this was not the case with Nourish, as all of the recipes were right in my mother and I’s wheel house, whether due to the ingredients, or simply the flavor combinations being what we naturally steered towards. I decided to first make the asparagus with creamy apple dressing, of which my brother thought was cheese, and therefore was actually a bit jealous of my father’s dinner plate. That being said, both of my parents thoroughly enjoyed the dish, and we have been using the dressing to dress our salads throughout the week. Next up, we made the carrot parsnip salad, of which we served a long side some grilled chicken. My mother thought it was certainly a dish that would be great served on a hot summer night, something that we are all looking forward too. With this past weekend being Mother’s Day, I wanted to make a special meal for my mother, where she did not have to do any of the cooking. Because she likes anything related to Mexican food, I chose to make the chicken tacos with blueberry salsa. Both our dinner guest and family members loved the flavor combinations, including the one year old. Despite making a triple recipe, everything was quickly eating. While my family enjoyed many of the recipes, I decided to try out one that I knew non one else would volunteer for – crispy fried sardine salad. Overall, I thought it was delicious, and definitely a nice way to change up how I typically eat sardines (i.e. right out of a can). It would also be a recipe fantastic for those looking to introduce sardines into their life, and are a bit hesitant at the thought. What I especially love about Nourish, is that despite being a cookbook directed towards those on the Autoimmune Protocol, it is also very friendly for other modifications of Paleo, including Ketogenic, which is currently how I must eat for the PK Protocol (a protocol for Chronic Lyme). Therefore, while some recipes may be off limits due to being higher in carbohydrates than my body can tolerate at the moment, there is a wide variety of recipes that I can (and will) be making for myself, such as the beef tongue collard wraps. Rachel’s book also features some creative ideas for flavoring agents when cooking, such as the infused sea salts. In all seriousness, you would think you had bought the salts at a speciality store, but no, you can make them at home in absolutely no time, taking an otherwise simple meal into a flavor wonderland. 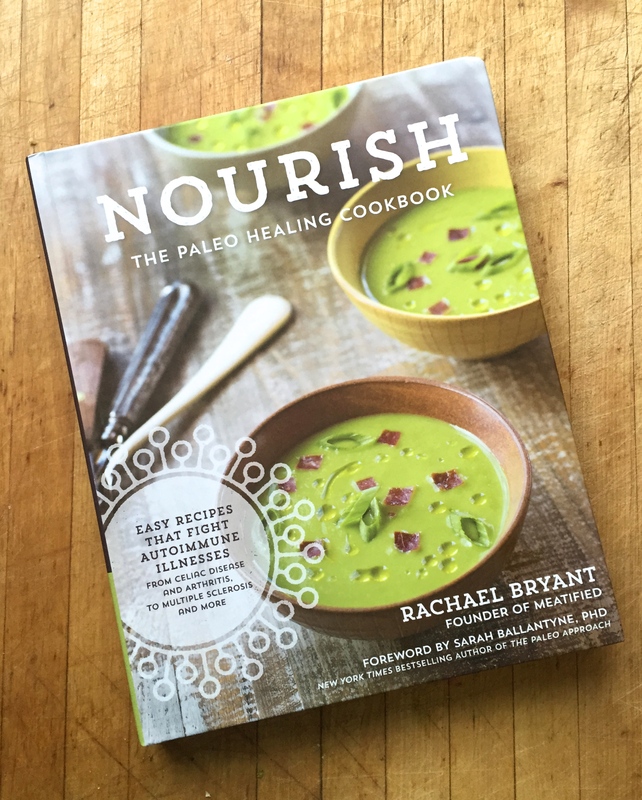 Overall, Nourish by Rachael Bryant is a diverse cookbook filled with accessible, family-friendly, yet nutrient-dense, creative (but not foreign), recipes that the entire family will love. If I had to rate it, I would most certainly give it five golden stars! Zest and juice the limes, reserving both the zest and the juice for later. Heat the oil in a skillet over low-medium heat. Add the garlic and cook until softened and fragrant, about a minute. Pour in the lime juice and cook until it bubbles and reduces a little, about a minute. Add the drained sardines to the pan and stir them through the oil to coat. Cook until the sardines are warmed through, another 2-3 minutes. Remove the pan from the heat and add the lime zest, cilantro, mint and capers, tossing to combine. 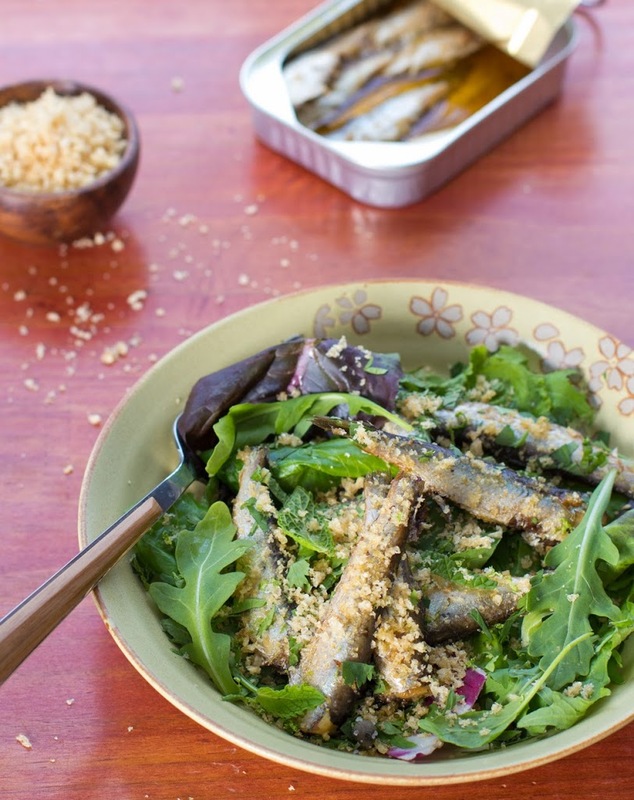 Divide the arugula between plates and top the leaves with the pan-fried sardines. Sprinkle the crushed pork rinds on top and serve immediately!